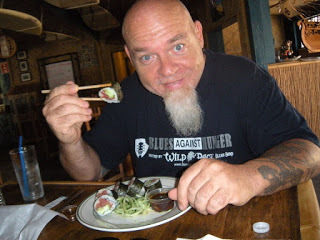 Anyone that knows me (Sixx), knows I LOVE SUSHI! I would go so far as to give up all others foods if only I had an endless supply of sushi. Last night I had a wonderful SURPRISE! Paradise Cove Tiki Bar & Grill where we played have ahi tuna sushi rolls that are out of this world. They were amazing, the fish was delicious and the flavors were addictive. Rachel and I had one each, and one more each for the ride home....and a side order of french fries - maybe not the greatest combo platter, but damn they were good...the fries were battered and season to perfection. In any case, Rachel and I are very excited about Wild Pack Wednesdays at Paradise Cove, because for us it's going to be Sushi (and french fries) Day Wednesday!